Bridal Spectacular features a royal Las Vegas wedding. To begin, our ceremony took place at THE Wedding Chapel at Vegas Weddings featuring elegant all-white floral displays with gold accents. 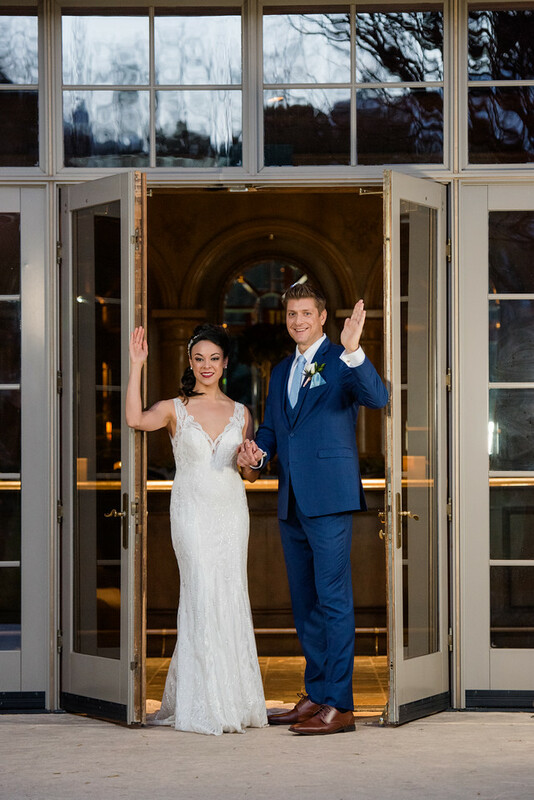 Our gorgeous bride Tala wore a sophisticated Allure Couture wedding dress with lace detail, an illusion neckline, and an exquisite cathedral length veil. Her prince, Attila donned a royal blue tuxedo with a gold bowtie and single white rose boutonniere. The wedding party was also dressed to the nines, including three lovely flower girls adorned with timeless floral crowns, two dapper ring bearers, and even our own queen! Following the ceremony, the royal wedding continued with a sophisticated reception at JW Marriott Las Vegas Resort & Spa. Showcasing two different settings, our outdoor display boasted a high tea wedding theme complete with mini pastries, a regal two-tiered wedding cake, and of course, tea! The elegant décor was sophisticated with hues of tan and ivory, soft pink and white flowers, and a magnificent golden tree with jeweled ornaments. Meanwhile, our indoor setting featured a regal setup styled with shades of blue and gold, sky-high centerpieces with draping pearls, and breathtaking floral garlands in the backdrop. Each of these settings will certainly deliver the royal wedding of your dreams! We hope you enjoy these photos as well as a behind-the-scenes video of the shoot. For more wedding planning tips and inspiration, please visit Bridal Spectacular online at bridalspectacular.com or follow us on Facebook, Twitter and Pinterest. Also, be sure to save-the-date for our Summer Bridal Spectacular show. Receive $4.50 off admission when you buy tickets online with promo code: BLOG2018. Click here for tickets and show details.